For decades Americans have over-housed themselves. Bigger was always better in the era of the McMansion. Now the recession has forced an awareness of what the off-grid community has always known – the smaller your house, the less it costs to heat and cool and maintain – indeed the less it costs to build in the first place. A survey by the American Institute of Architects reveals that 57 percent of architecture firms reported a decrease in the square footage of their residential projects in 2010 compared with 13 percent back in 2005. And according to the National Association of Homebuilders, the average house size dropped last year to 2,438 square feet, which is still too large for a typical family. Stuart Hill, the principal architect at Apparatus, sees his clients going smaller not just to save money but also to save face. ”In the ’90s all my clients were driving Land Rovers, and now they all have Priuses,” he told the New York Times. ”They don’t want to be at the carpool line at their school with what’s perceived as a gas guzzler. It’s the same with houses.” But size, of course, is relative. Two thousand square feet seems modest until you compare it to Path Architecture’s prototype for an off-the-grid prefab house called the Roho, which at about 200 square feet is smaller than your average garage. A glass wall and double-height ceiling make the living space feel larger than it is. ”We went through a sort of baroque period, with an obsession for moreness,” Alan Koch told the New York Times. Koch was one of the first to have his off-grid home featured in Details magazine about four years ago. Replacing this moreness is the cult of small. Books like ”Tiny Houses” (Rizzoli, 2009), the new edition of ”Little House on a Small Planet” (Lyons Press, 2009) and ”Small Eco Houses: Living Green in Style” (Universe, 2010) celebrate the beauty of smallness; on blogs and web sites, the microhouse has become a standard. Koch and his partner, Linda Taalman, have made a cottage industry out of smallness. Their firm is currently working on more than 10 of its prefab houses around California (average living space size: about 1,000 square feet). The houses are built using recycled materials and feature solar panels, but their most earth-friendly aspect is the footprint, which sets limits on construction materials and energy use. (Koch and Taalman’s own house, near Joshua Tree, cost about $265,000 to build.) And according to Koch, the intimate scale helps to bring owners closer to nature — if not to one another — and forces them to pare down to the essentials. Dirk Denison, a Chicago architect who specializes in large luxury houses, recently worked on the renovation of a 2,200-square-foot-house in Carmel, Calif. The owners, Kathy and Gary Bang, had downsized from four houses — including a 5,000-square-foot dwelling near Asheville, N.C., with a 1,100-square-foot guesthouse — to just one, which Denison reimagined with a large central courtyard and spaces that flow into one another. Now every room is used on a regular basis (rarely the case with their previous houses). ”It’s very freeing to live with a lot less stuff,” said Kathy, who still can’t seem to believe that she owns only one set of flatware. In cities where real estate is scarce, ”less is more” is the only way to go. In the California cities of Manhattan Beach and Hermosa Beach, for example, ultrasmall lots pose a challenge to even the most creative architects. Houses of between 1,600 and 1,800 feet by architects like Dean Nota, Make Architects, LeanArch and XTen Architecture all feature multi-use living spaces on the top floors, large windows and wide balconies to maximize views, direct sunlight and the illusion of space. Indeed, Duo Dickinson, a Connecticut architect who has written several books on small houses and designs them as well, said the best small houses share the same basic ingredients: interconnecting axes and vistas, high ceilings, a connection between inside and out, and density of storage. A case in point: the 1,300-square-foot renovation and addition by the San Francisco firm Apparatus in that city’s Glen Park neighborhood, on a corner lot that is only 13.5 feet wide. In order to make the best use of the space, the architects left the interior roof exposed and created rooms that serve multiple functions: the kitchen and dining room double as hallways, and the master bathroom also serves as a laundry room. The Portland, Ore., architects Brian White and Michel Weenick of Architecture W recently built a 1,500-square-foot house in Nagoya, Japan, where multi-use rooms are the cultural norm. The kitchen functions as a dining room, and the living room is designed with sliding doors that can close off a guest bedroom with a Murphy bed. There is also a 650-square-foot apartment below for the in-laws. The majority of our clients here in North Carolina are downsizing their homes instead of extending it and I think it’s the right way to go. I have recently developed an interest, and am almost slightly infatuated with the idea, of living “off-the-grid”. I love entertaining the idea of these tiny houses, and alternate living situations like shipping container conversions. I’m curious if I have what it takes to thrive doing something like this. I am a contractor soon to be former contractor, I am also a former off grider from Alaska soon to be a born again off gridder ( has nothing to do with religion) I have been planning to build in the Far West Texas desert on my 30 acres. The link bellow is what I am going to be building ( with some modifications) very soon. What are really good shapes to make an off-grid house? Circular or square? 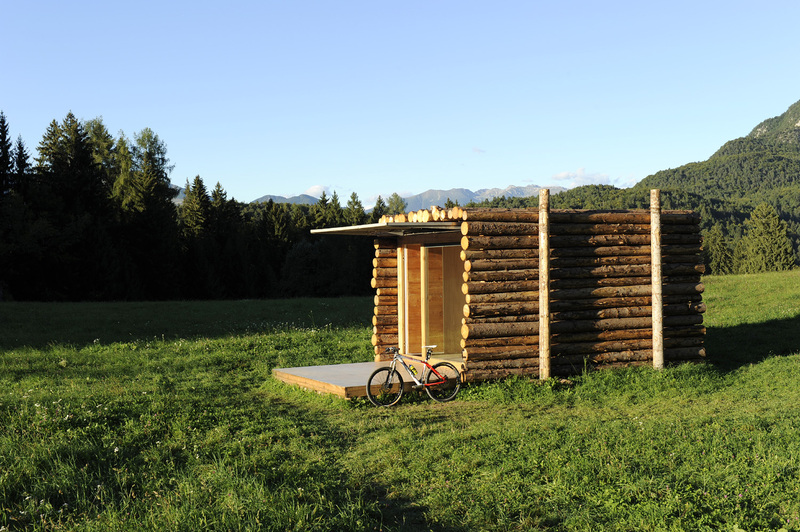 Did it really cost $265,000 to build their “little house”? It’s sad that municipalities force people into huge homes, by refusing to let people build small homes. It’s all about the money (taxes) that they want to rake in. wow, i also wanted to have a home like this one! Isn’t it time some pressure be applied on municipality building codes to force excessively large house sizes because larger houses are good for the municipa property tax base. I have lived in communities where they stipulate a minimum of bedrooms and each bedroom must be at least 100 square feet.